While intrusion is the first threat that comes to mind when most people think of security systems, there are other threats that a security system can help protect against as well. Fire is one such threat, because in a burglary the loss is often a broken door and around $3000 of possessions, whereas with an undetected fire, the loss could be well over $100,000. That is why we recommend that all of our clients with monitored security systems consider adding at least one monitored smoke detector to their systems. Many insurance companies even offer an additional discount for monitored fire protection, because they too, recognize the value of this additional protection. As with most detection equipment, there are both wireless and hardwired versions of most fire detection equipment. 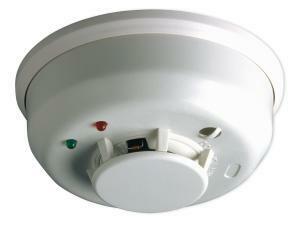 A smoke detector often consists of an optical chamber that is used to sense the presence of smoke. this is usually accomplished by measuring how much light is blocked by smoke in the chamber or by how much light is reflected off or scattered by the smoke. In commercial environments, duct detectors are often place in the air vents as an efficient way to detect smoke. The Honeywell 5808 pictured to the left is an extremely versatile device in that it can detect smoke, heat, as well as freezing. Smoke detectors are the most common fire detection equipment, but in some situations, smoke detectors aren’t as effective. These circumstances are areas with large amounts of smoke, steam and dust, such as kitchens, garages, and furnace rooms. In these locations, heat detectors are often used. A heat detector triggers when it’s threshold for the rate of increase in temperature is exceeded. Our team will help you select the proper smoke detectors and heat detectors for your Overland Park or Kansas City metro home. To select your smoke detectors, call us at (913) 766-2248.